The ballots are in and this years Aipono winners were announce at a glamorous gala held at the Four Seasons Wailea! Check out the winners here! 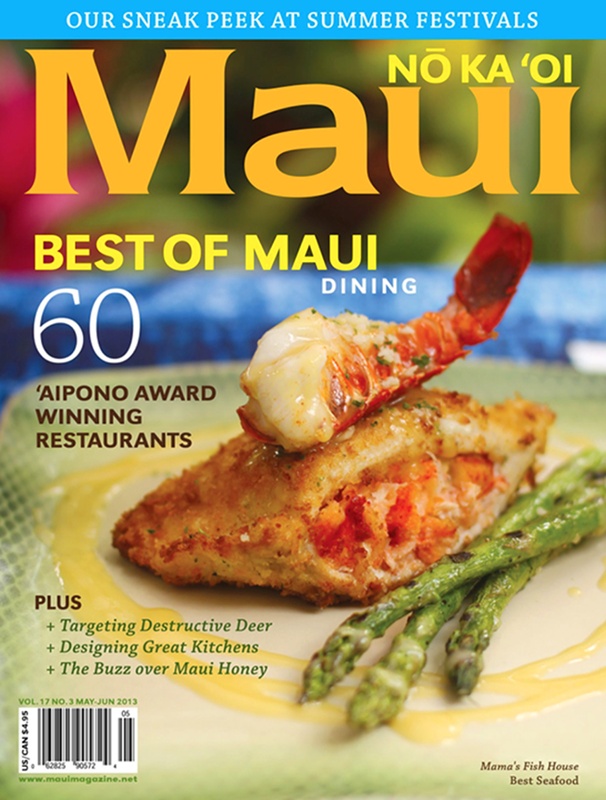 This year’s Best of Maui issue features a cover photo I shot of Chef Cameron’s beautiful creation at Spago Maui.Congratulations to all this years winners! 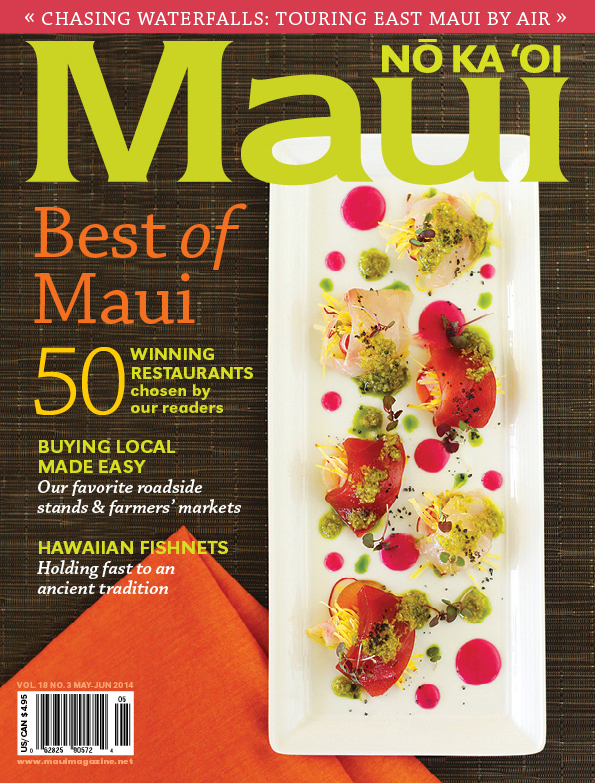 This issue is full of beautiful stories about all of Maui’s best of the best. 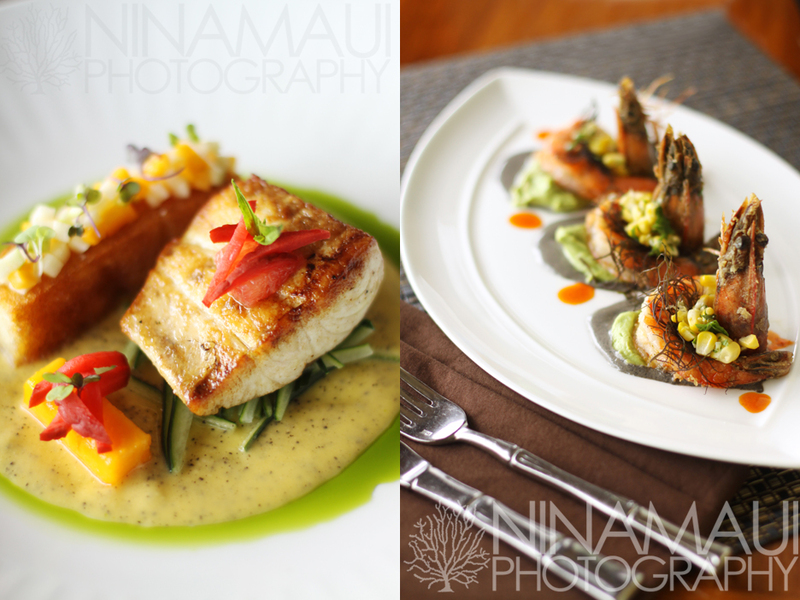 Posted In: Editorial, Food Photography. It’s out! And I was lucky to be a part of it! 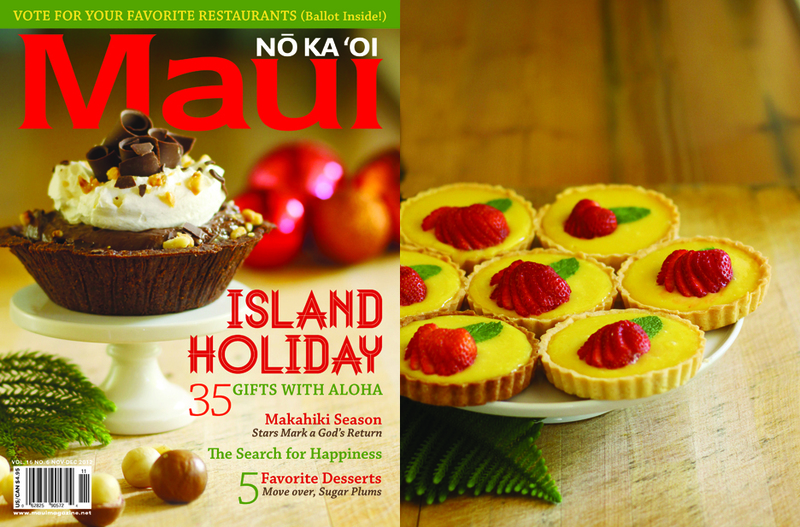 I was sent on assignment for HAWAI’I magazine to shoot Maui’s Da Kitchen, Star Noodle and Sam Sato’s in Wailuku for their 2013 Food Issue. Thrilled to see that my photo of Da Kitchen’s crazy Notorious B.I.G. made it to the title page! Once again I had the pleasure of photographing dream team Chef Brian Etheredge and Chef Chris Kulis of Capische fame. This time for Modern Luxury Hawaii. The cover photo was of a stunning creation full of color, texture and height, with the ingredients plainly discernible yet so artfully put together. I photographed the duo right before their nightly dinner rush on their famous lanai as we worked with the sun’s every speeding decent. A fabo collabo, I can’t wait to work with these incredibly gifted guys again! 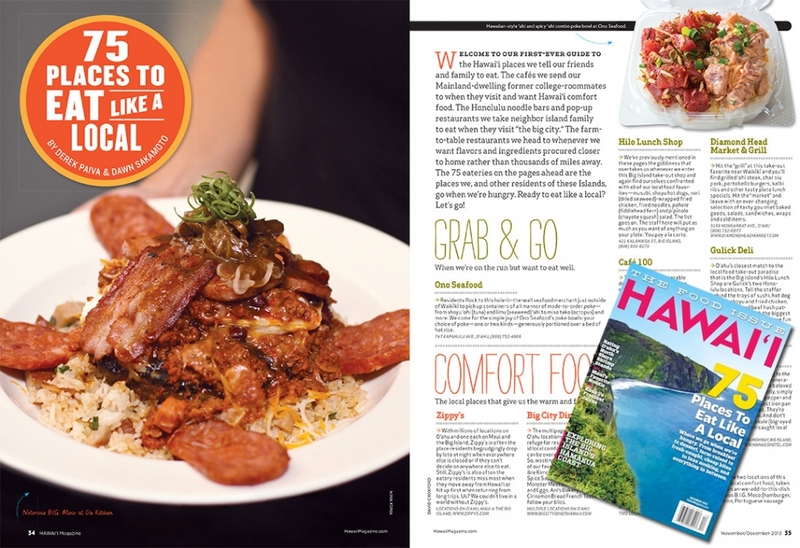 The May/June Issue of Maui No Ka Oi magazine featured a photo taken by myself and Art Director John Giordani at Mama’s Fish House. It pictures their signature stuffed Mahi Mahi dish. I love the bright colors in the copy and title that compliment the photo. If any of you dine at Mama’s, this is the entree to order! 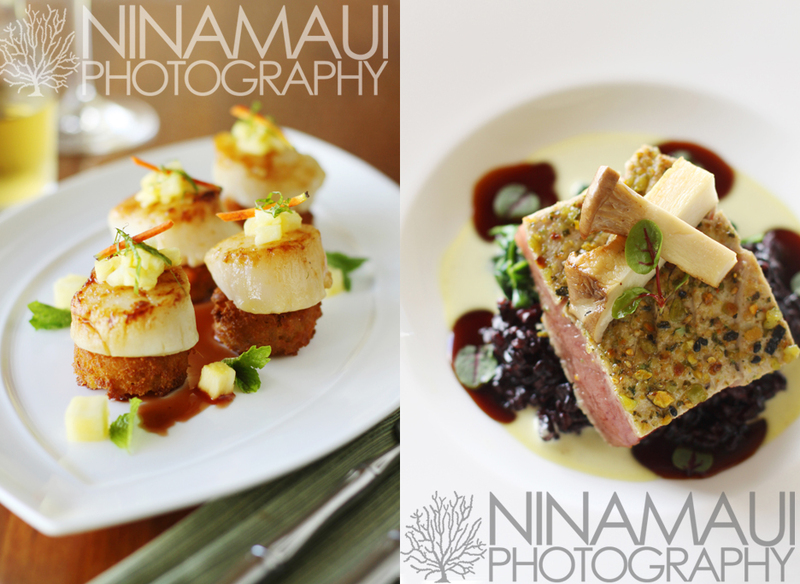 Posted In: Editorial, Food Photography, Uncategorized. 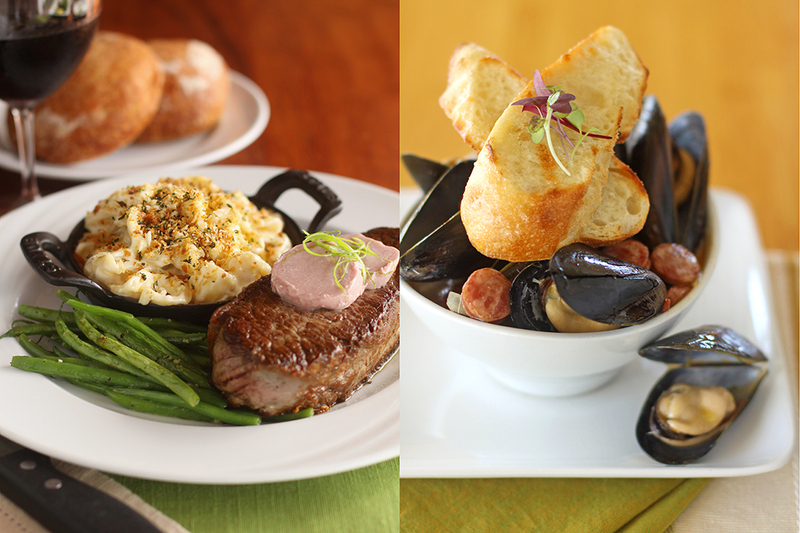 Our annual shoot for all 3 restaurants was a success! Thanks to Keith at Ten Foot Design. Here is a sneak peek and some of my favorites! 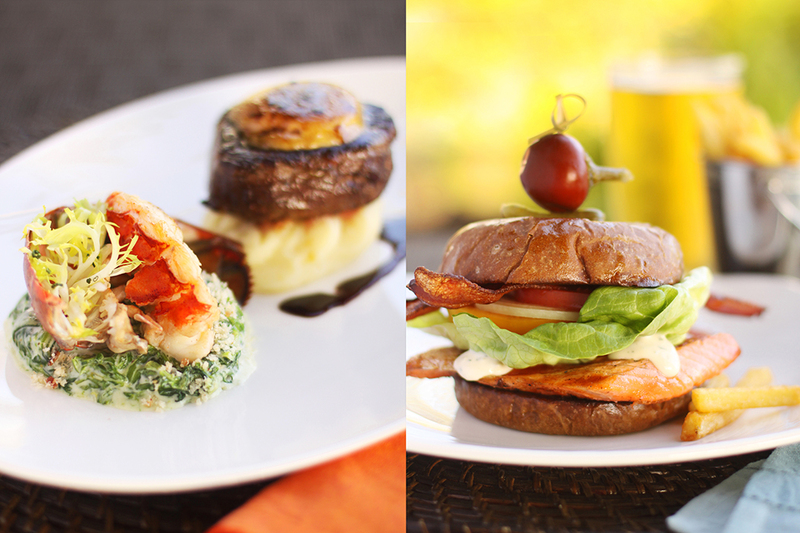 Posted In: Food Photography, Uncategorized. 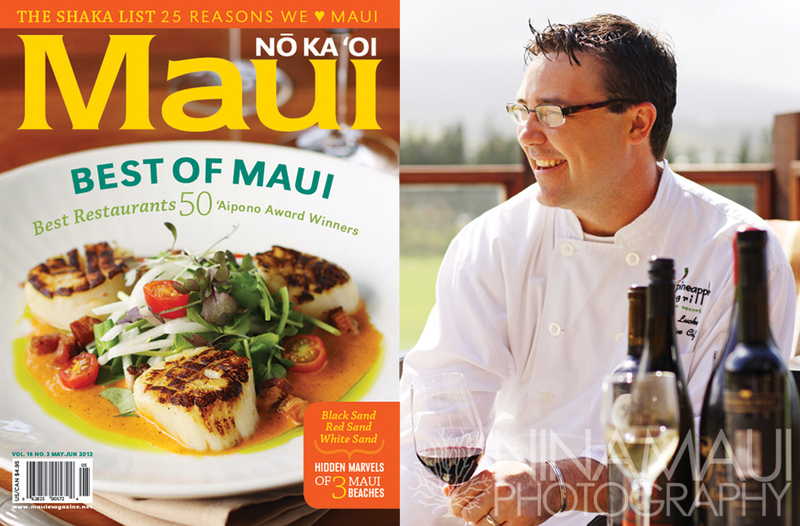 Shooting the Dec Cover for Maui No Ka Oi was fun – as always – especially since I was with Art Director John Giordani. He brought the festive props and made it just a bit Hawaiian with a few mac nuts. I must say, we sampled one of these amazing pies and were floored with how tasty it was! The kicker: There’s a ooey, gooey puddle of caramel in the middle. YUM! To the right is another option we took for the cover but the chocolate pie stole our hearts. Happy Holidays! 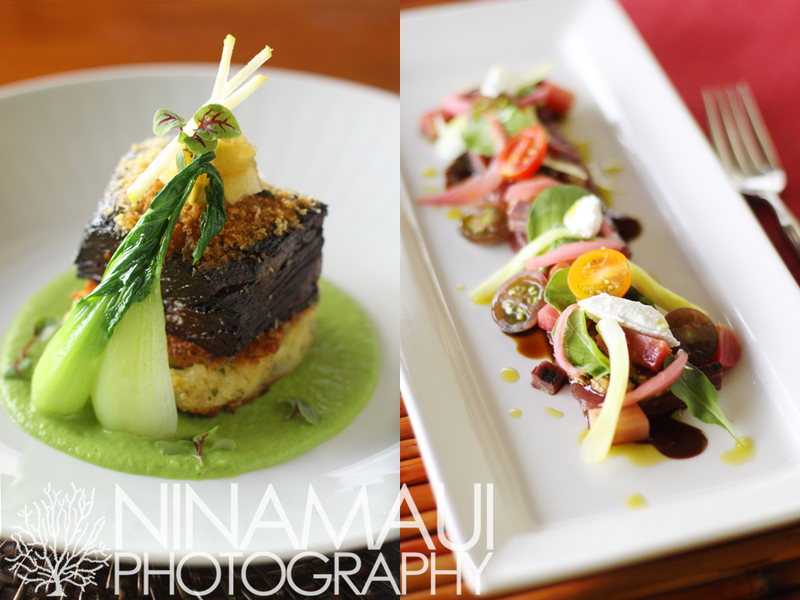 I was called to Pineapple Grill to take photos of their new menu featuring beautiful cuisine by Chef Isaac Bancaco. Here is a sampling of unbelievably beautiful and delicious entrees and appetizers, with a focus on fresh, local ingredients prepared in innovative ways! Find out more about Pineapple Grill here! 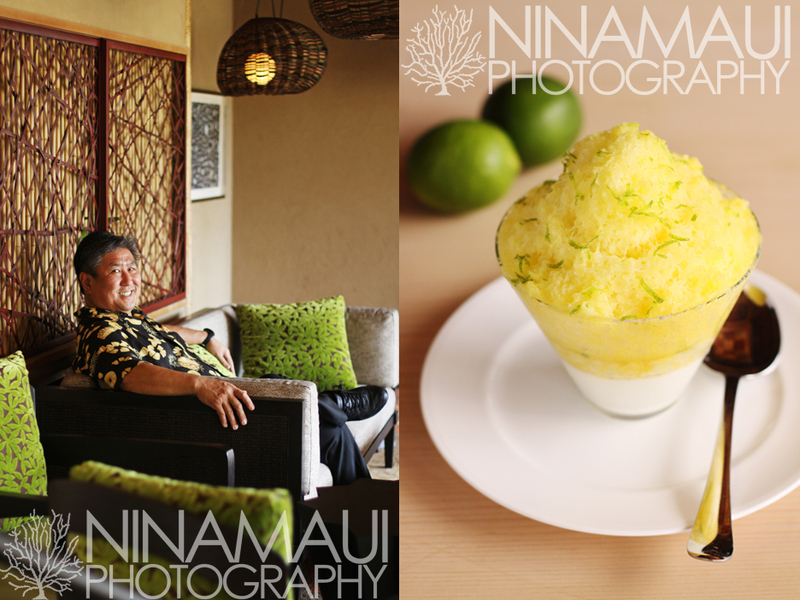 When I was sent on assignment to Amasia by Maui No Ka Oi magazine, I was in for a lot of surprises! The smooth bar was made out of unfinished wood and was as soft as fine leather, and I was told it had to be sanded every night to keep it looking so pristine. You can appreciate the grain in the Dining cover photo below. The traditional Japanese restaurant was lovingly updated with beautiful accents to the interior, but definitely remains true to it’s heritage. Chef Alan Wong was great to work with and photograph, a stoic and humble man with an infectious smile… and yes! Also a passionate food photographer! Here are some fun additional photos and outtakes. 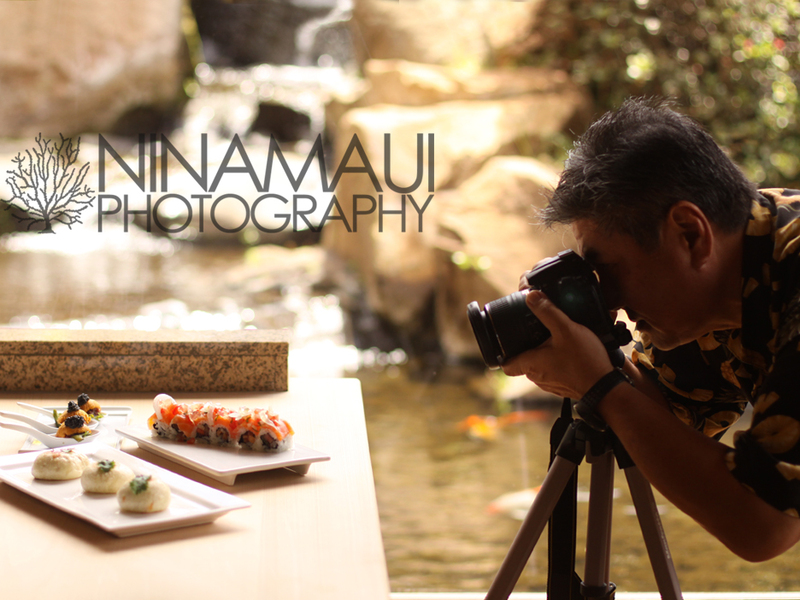 Posted In: A Day in Maui, Editorial, Food Photography, Portrait Photography. 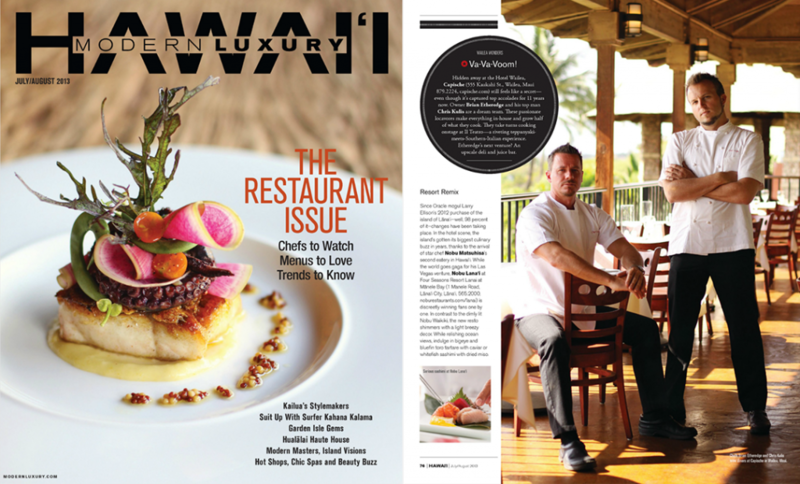 I had the pleasure of being sent once more to beautiful Monkeypod Kitchen Wailea for the latest 2012 Restaurant Issue for Modern Luxury Hawaii magazine. I was thrilled at the jaw dropping full page photo feature! Careful food styling and rustic prop styling made the photo a drool worthy feature. 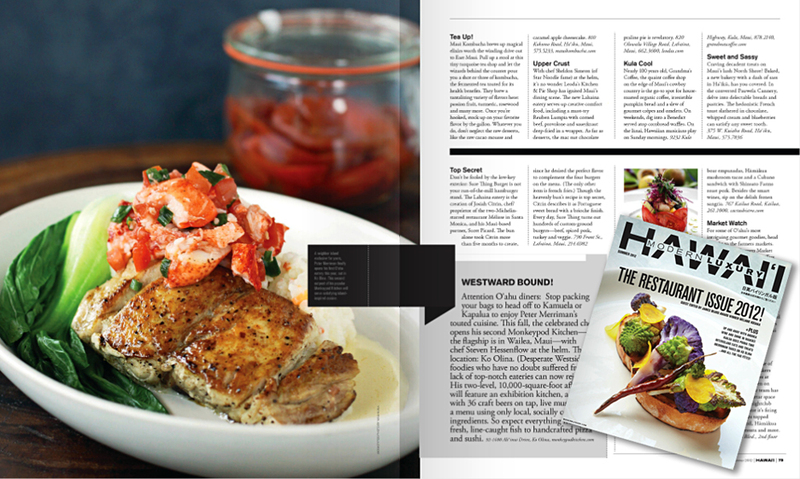 Foodies must indulge in this incredible dish: Monkeypod Kitchen’s Fish Special. Glistening pan seared Lehi with coconut-carrot-ginger risotto, lobster-bok choy salad and Big Island honey butter glaze (finished with a balsamic drizzle, but for this photo, we opted out)…. Need I say more?